Description: Buddy is a snartly dressed bullfrog that jumps and makes a "grumph-grumph" sound when pulled. In 1961 Buddy was slightly changed "wearing" a different outfit. 1959-1960 - FPT4352 - Rectangular wooden cut-out frog with paper lithographs on the top and edges of a green frog wearing a red tuxedo jacket. The top of the frog's head is a green rounded wooden block with round white wooden eyes on the sides and a round red wooden top hat on the top. The frog has short wooden cut-out arms with paper lithographs on the sides of red sleeves and green "hands". The frog has long wooden cut-out double-jointed back legs with paper lithographs on the sides of green frog legs with dark green spots. 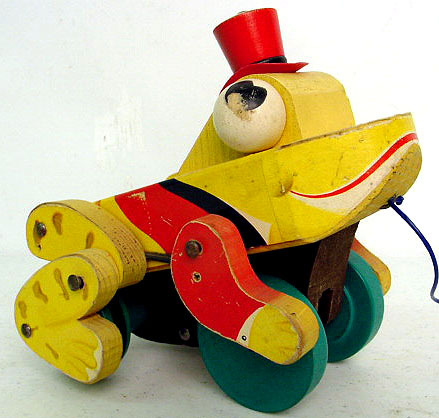 The frog rolls on 4 green wooden wheels (back legs attached to back wheels). The frog jumps and makes a "grumph-grumph" sound when pulled. Measures 6" high, 6-1/2" long, and 5" wide. *See "Variations" below. 1961-1961 - FPT4353 - Rectangular wooden cut-out frog with paper lithographs on the top and edges of a green frog wearing a green tuxedo jacket and red and white checkered pants. The top of the frog's head is a green rounded wooden block with round white wooden eyes on the sides and a round red wooden top hat on the top. The frog has short wooden cut-out arms with paper lithographs on the sides of green sleeves and white gloved "hands". The frog has long wooden cut-out double-jointed back legs with paper lithographs on the sides of red and white checkered pants. The frog rolls on 4 green wooden wheels (back legs attached to back wheels). The frog jumps and makes a "grumph-grumph" sound when pulled. Measures 6" high, 6-1/2" long, and 5" wide.